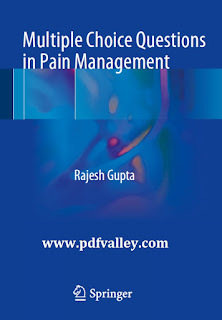 You can download Multiple Choice Questions in Pain Management by Rajesh Gupta free in pdf format. This book presents current clinical knowledge relating to key topics in acute and chronic pain in a multiple choice question (MCQ) format. Individual chapters are devoted to subjects such as the anatomy of pain pathways, pain processing, evaluation of pain, different pain syndromes and pain involving different regions of the body, pharmacologic and physical pain management, neural blockade, and special procedures. Each of the MCQs has four or five answer options in true/false format, and the answers are discussed in detail with provision of suitable references whenever appropriate. Multiple Choice Questions in Pain Management will be especially valuable for those who are sitting anesthesia board exams anywhere in the world. It will, for example, meet the needs of candidates for the FRCA examination (in which 20-25% of MCQs relate to pain management) or the FFPMRCA examination (Fellowship of the Faculty of Pain Medicine of the Royal College of Anaesthetists). In addition, the book will be useful for pain fellows and for all clinicians who are seeking to improve their knowledge of pain management.